Recommended Citation: Reinicke, B A. Virtual Organizations: A Definitional Framework. In The Proceedings of the Conference on Information Systems Applied Research 2009, v 2 (Washington DC): §4133. ISSN: 0000-0000. In recent years the concept of the virtual organization (VO) has received a great deal of attention in both the business press and academia. While a fair amount of research has focused on the virtual organization, very little agreement exists on how to define it, or even approach it as a concept or an organizational form. This has been further complicated in recent years by the increased trend towards outsourcing job functions by companies and the associated research that has gone with this. It is difficult to research virtual organizations, and the processes organizations follow to become virtual, without a good framework in which to place the research. It is impossible to relate or compare the research that has been done under various definitions of the VO, without a common structure to relate them to one another. 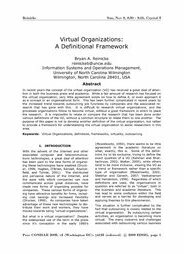 The purpose of this paper is not to develop another definition of the virtual organization, but rather to provide a framework for understanding the virtual organization to assist researchers in this area.